Mandala class- make your own sand Mandala! Come learn about Mandalas and make a Sand Mandala to take home. 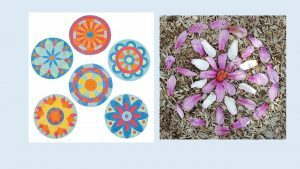 Play with Nature Mandalas, a temporary form of Mandala. Please register so we know how much material to provide. The literal meaning of mandala, which is a Sanskrit word, is circle and like a circle, the mandala represents wholeness. Mandalas have been considered as the symbols of balance in the body and mind and the relation of human life to infinity. A mandala is often a symbol that is utilized to help people focus in on meditation.